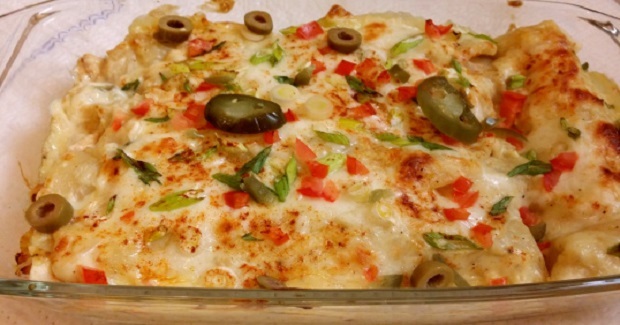 Cheesy Chicken Enchiladas Recipe - Gutom Na! Posted on Thursday, August 11th, 2016 at 4:02 pm. Melt butter in a large saucepan over medium heat. Add onion and cook for 4-5 minutes until the onion is tender, then add cumin, salt, pepper & flour. Stir in the broth and cook on high, whisking periodically until thickened and bubbly. Add in the pickled jalapenos and cream, then cook another 3 minutes over medium heat. Remove from the heat and add 1 cup of Mozzarella cheese. Place about ⅓ of the filling onto each tortilla, roll up and arrange seam side down in a lightly greased 13 x 9 baking dish. Bake covered, in a 180 degree oven for about 15 minutes or until heated through.